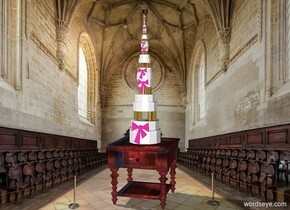 second huge wedding cake on huge table. first big wedding cake on second huge wedding cake. third wedding cake on first wedding cake. fourth small wedding cake on third wedding cake. fifth very small wedding cake on fourth wedding cake. very tiny horse on fifth wedding cake. very tiny man on horse. second very tiny man on horse. cat is on the sand. a dog is next to the cat. blue light above cat. The first mirror is facing west. 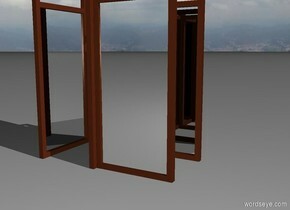 The first mirror is four feet to the right of second mirror. The second mirror is facing east. The third mirror is facing north. The third mirror is four feet in front of the fourth mirror. The fourth mirror is facing south. first mirror is very big. second mirror is very big. third mirror is very big. fourth mirror is very big.